Baby pictures of the the W's. 4-16-06 - About 2 weeks old. 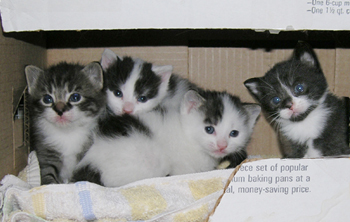 These adorable kittens were born just a few days after their mama (The Warrior Princess) was rescued from a townhouse complex next to an amusement park. Mama is very feral but these precious babies are sweetsweetsweet. Their genders aren't yet determined with certainty but one thing is for sure: these little fluffies are going to be someone's best buddies. They are so friendly & inquisitive & cuddly. And very fun to play with. And adorable! 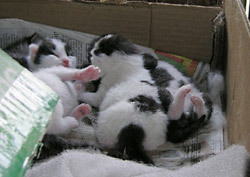 These cuties are healthy, bright & very playful, although still a little wobbly. Did I mention they’re adorable? 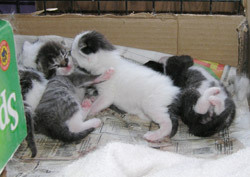 :) They'll be ready for adoption in mid-June.